Julienning is also known as french cutting technique. The technique is used in different cuisines and it is a very good skill to have in your arsenal. 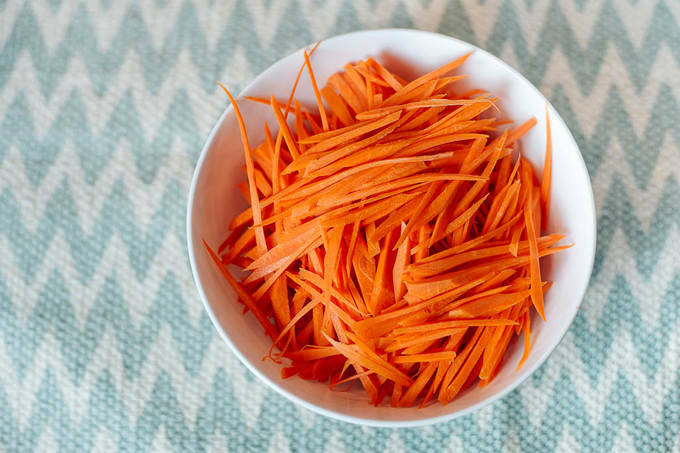 You can pretty much julienne any solid vegetable or a fruit. Hand julienning can be replaced by using a mandolin. However, I find it harder to use it with vegetables like carrots. I also often end up scratching myself against the mandolin. The biggest pitfall of mandolins in my eyes is that you have so much left over of the fruit or the vegetable, that you inevitably either julienne it at the end or just waste a perfectly good produce. Julienning is quite simple once you get the hang of it. Remember, practice makes perfect. Follow the photos below as a reference. Whatever you wish to do in your kitchen, your first stop is to get good working knives. They don’t have to be very fancy. But they need to be sharp enough to help you along the way of cutting and chopping. We will talk about how to choose knives and taking care of them in a different post. But for now know that if you want to julienne successfully, a sharp and a sturdy knife is a must. A strong and a reliable cutting board is a must in any kitchen. It might take some time for you to find a perfect match. Bamboo cutting boards are usually a go-to choice for me personally. But I love my wood cutting boards, too. Make sure you are placing your cutting board on something sturdy in order to use it for julienning. Sliding, skidding cutting board under your knife, especially while you are julienning, is a disaster waiting to happen. Let’s take a carrot as an example for julienning. Wash the carrots, peel off the skin and cut off 1/4 inches from each end. The technique of julienning any vegetable or a fruit starts off with creating uniform stacks of aforementioned produce. Imagine that you will need to create a matchstick shape (or a small box shape). 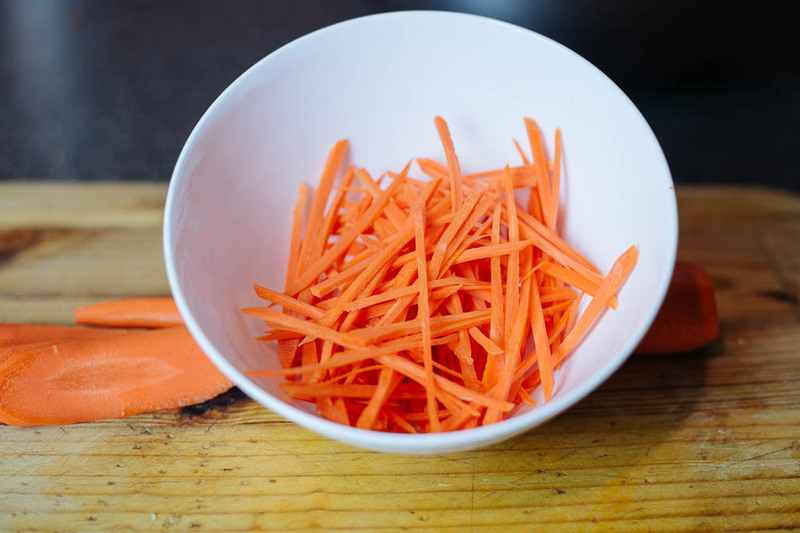 With a carrot, the easiest way is to cut it into even slices going at a 30 to 25-degree angle, semi lengthwise. You might end up with small pieces of carrot here and there. That is not a problem at all. You can still stack those and keep on cutting. 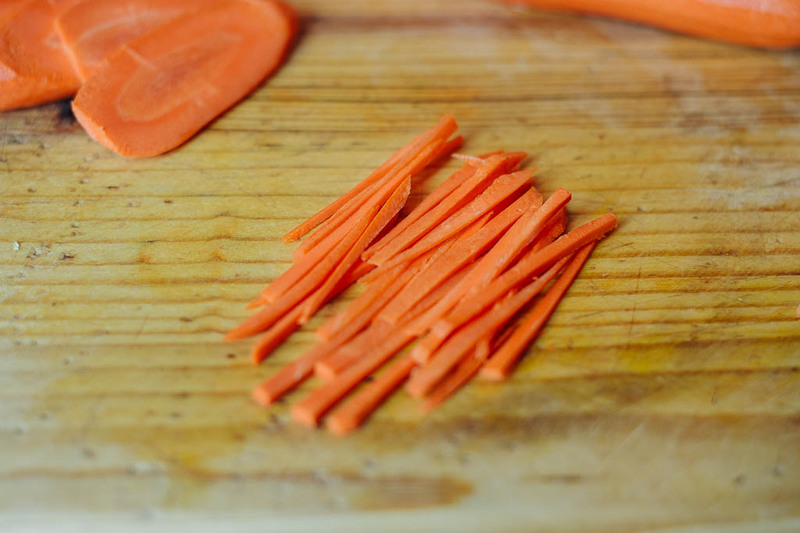 Once you have oval-shaped discs of carrot, stack 3-4 of the discs for your next step. Go with a smaller stack if you are just learning to julienne. Take your first stack of 3 or 4 discs, cut them lengthwise into strips of 1/8 inches. The thickness of the final product will vary from recipe to recipe. Continue julienning until you are done with all the carrot discs. Start adding julienned vegetables to your salads if you wish to practice more. I hope this technique will be helpful in your cooking endeavors. I am looking forward to hearing from you. Let’s take a carrot as an example for julienning. The technique of julienning any vegetable or a fruit starts off with creating uniform stacks of aforementioned produce. Imagine that you will need to create a matchstick shape (or a small box shape). 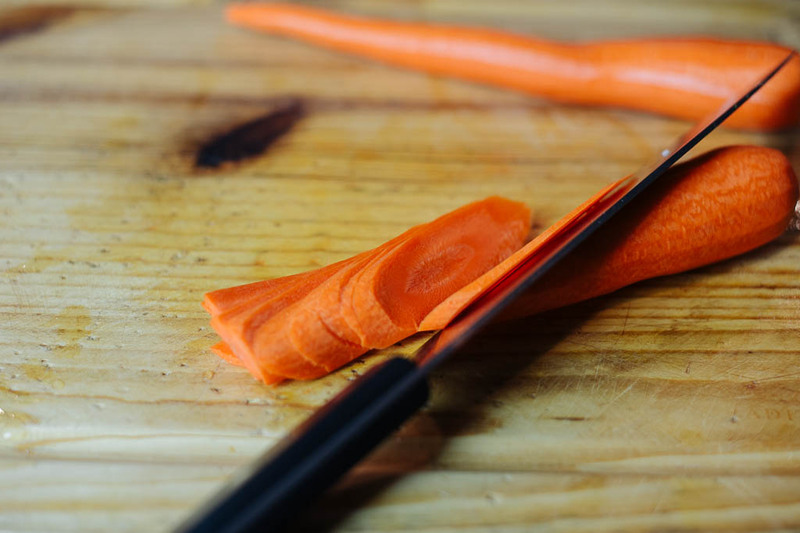 With a carrot, the easiest way is to cut it into even slices going at a 30 to 25-degree angle, semi lengthwise.